In many West African cultures, the griot plays an important role at many different levels. Holders of histories, griots are storytellers, poets, and journalists, possessing both the ability to recount generations of history while immediately adding current events to that lineage as well. Vieux Farka Touré's latest album Mon Pays effortlessly fits into Mali's rich music history while also presenting itself as a musical newsflash contrasting the turmoil that plagued the country in the last 18 months. In the griot tradition, histories and stories were passed down the generations through families; each griot passed his knowledge to his son, preserving cultural history. 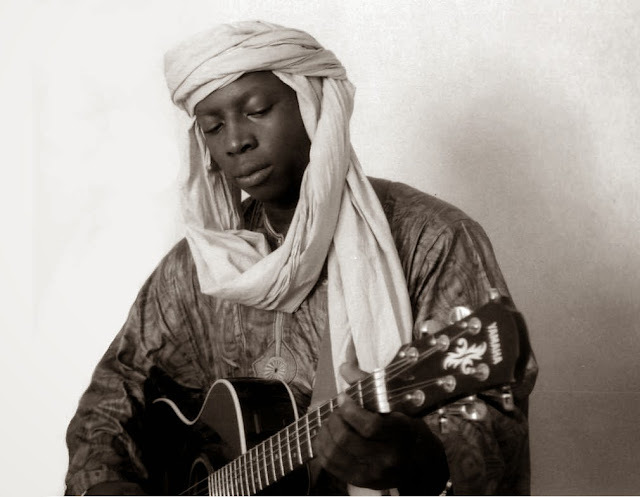 Vieux's father Ali Farka Touré has done just that. Although apparently he pushed Vieux towards a career in something else rather than music, Vieux is truly his father's son and rather seamlessly continues his father's musical legacy while also making a bold embrace of his country, his pays. Vieux links up with Sidiki Diabáte, son of Toumani Diabáte (who collaborated with Ali Farka Touré on the incredible In The Heart of the Moon album) and creates another stunning release which musically seems to acknowledge Mali's rich musical history while continuing to blaze ahead.